Some see junk, I see treasure…art on wheels. Photos by the author except where noted. Your first car may have been like mine. Rust everywhere, peeling paint, torn upholstery, smelly interior, worn out clutch, engine that burned oil…you name it, my 1951 Mercury had it. That was about 60 years ago. You know what I miss today? Besides wishing I still had it, I miss not caring that the car was a mess. Even after treating the Merc to a $19.95 Earl Scheib paint job, which did little to hide bondo-covered rust holes, dents and other imperfections, I didn’t worry about making it look nice. Since then, I’ve owned lots of new cars, kept them polished and obsessed over the usual things: dents, scratches, fender benders, bird poop, mud on carpets and seats, etc. It was all about keeping up appearances. 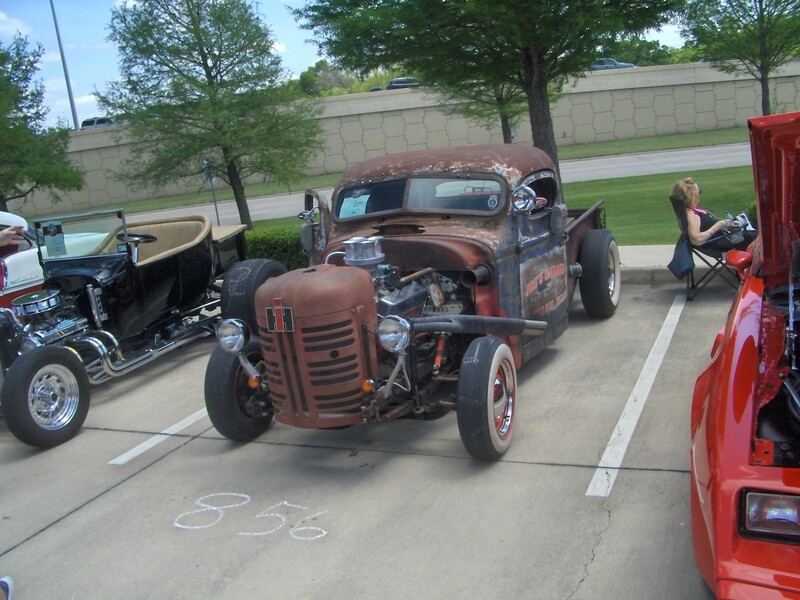 Then, about 25 years ago, I started seeing rat rods at car shows. They stood out like sore thumbs among the restored classics and hot rods. At first, I didn’t know whether I liked them. But in time, I realized these ugly-duckling creations had a therapeutic effect. My blood pressure dropped each time I examined one. They reminded me that life wasn’t about perfection. Rather, it was about self-expression and fun. It was all right to have a less-than-perfect car. Slowly, my teen psyche was returning. 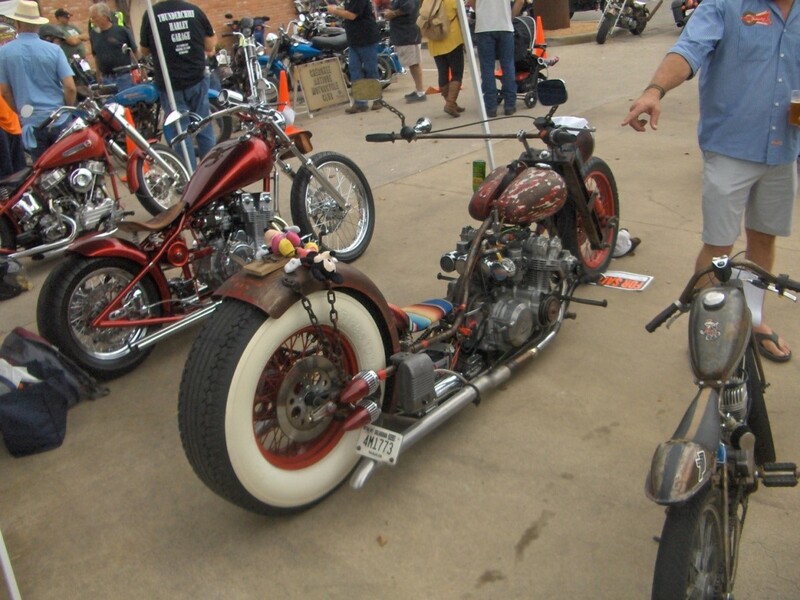 I enjoy the freedom from conformity that rat rods represent. They are an art form and express the owner’s creativity and individuality. Their owners told me many interesting stories. Rat rod owners were the nicest bunch, too. A few years ago, an old guy at the Nocona, Texas, classic car auction told me about his rusted coupe that had a tractor’s grill and enormous engine with tall, chrome exhaust stack. “What powers that beast?” I asked. I believed him. The ground shook and the stack roared when he started it. Now I understood why he was hard of hearing. 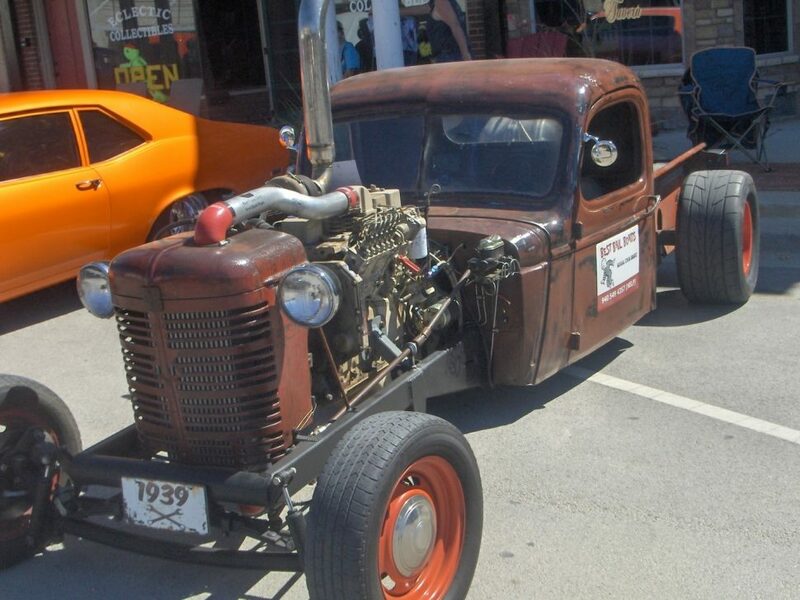 Rat rod owners are the nicest people you’ll meet, such as the man who built this Cummins diesel-powered beauty with an old tractor’s grill. We met at a classic car auction in Nocona, Texas. For this man and many other rat rod owners, it was all about being rebellious and intentionally distressing their vehicles…everything society had taught me not to do. I had to unlearn so much. 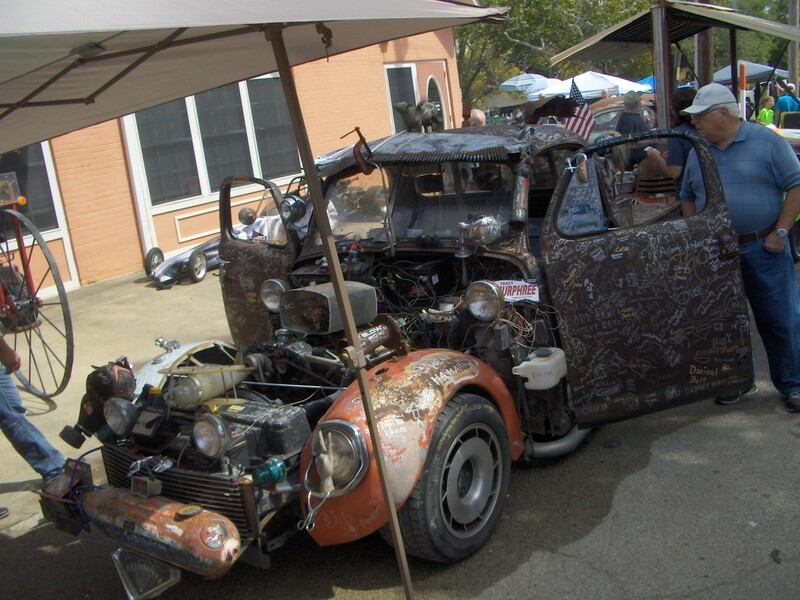 Many rat rod owners previously built six-figure, pristine hot rods and classics that were show winners. They told me they were tired of maintaining and hauling them in trailers to shows. 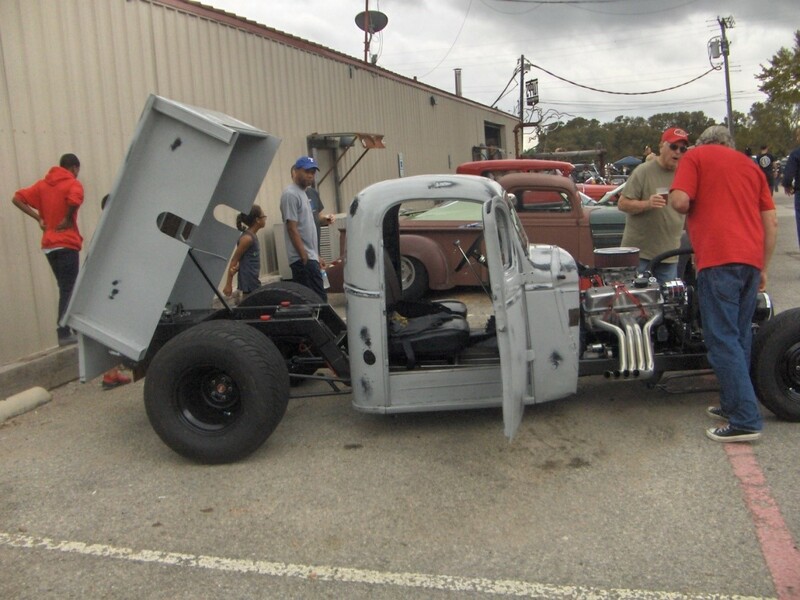 I asked a man at a McKinney, Texas, rat rod show what motivated him to build his creation. Finding the “fun factor” is what drives some rat rodders to build their creations. Finding the right part often involves trading or building your own. Come to think of it, most of my high school friends owned rat rods. We didn’t call them that, of course. They were just beat-up stockers — jalopies, as my Dad used to say — “customized” with Moon hubcaps and fender skirts. A few were “souped up” with multiple carbs, headers, and more powerful engines bought at junkyards and installed in backyards. A classmate removed the flathead straight-eight from his four-door ’54 Pontiac Chieftain and replaced it with a ’56 Olds V-8 sporting a four-barrel and dual exhaust. The engine hooked up to the Pontiac’s dual-range, four-speed Hydra-Matic. The big engine transformed the timid ride into a sleeper-rocket. Its rear end almost scraping pavement, the ’49 Mercury’s engine bay no longer housed a flathead V-8. A car shop buddy transplanted a ’52 Olds V-8 and Hydra-Matic into the tight space. Dual glass packs rumbled and exhaust tips scraped macadam when he launched, producing sparks and excitement. 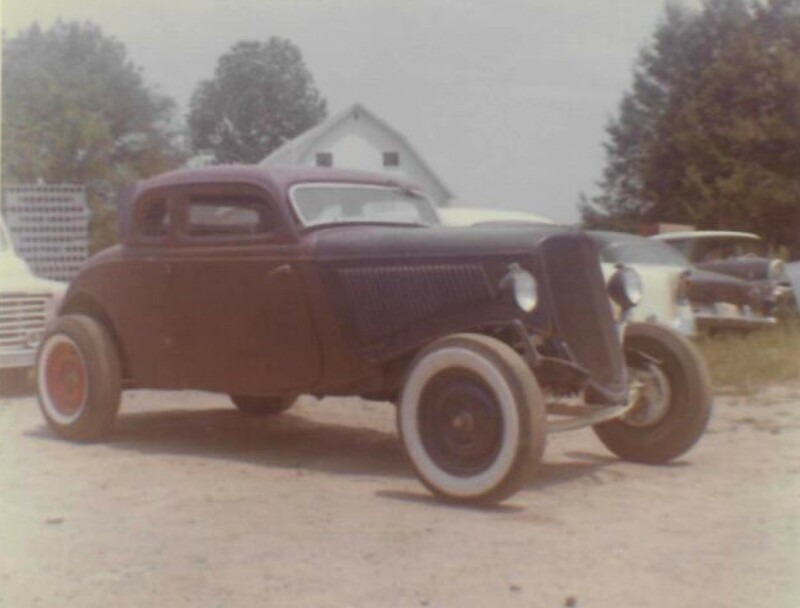 Barry’s ’34 Ford five-window coupe, chopped 4 inches with Cadillac V8, was the quintessential rat rod. It was stripped down to bare essentials. Its light weight and three deuces made it fast. Photo by Barry. Harvey’s ’40 Ford convertible, dubbed “Blue Moon” due to its bright blue paint job, had what every boy wanted: a Vette mill under the hood. It was “only” a ’55 Vette motor with four barrel, but it delivered 195 horsepower – enough to keep the lightweight Ford ahead of most cars. Chrome wheels and a chopped windshield and top made it a visual treat. 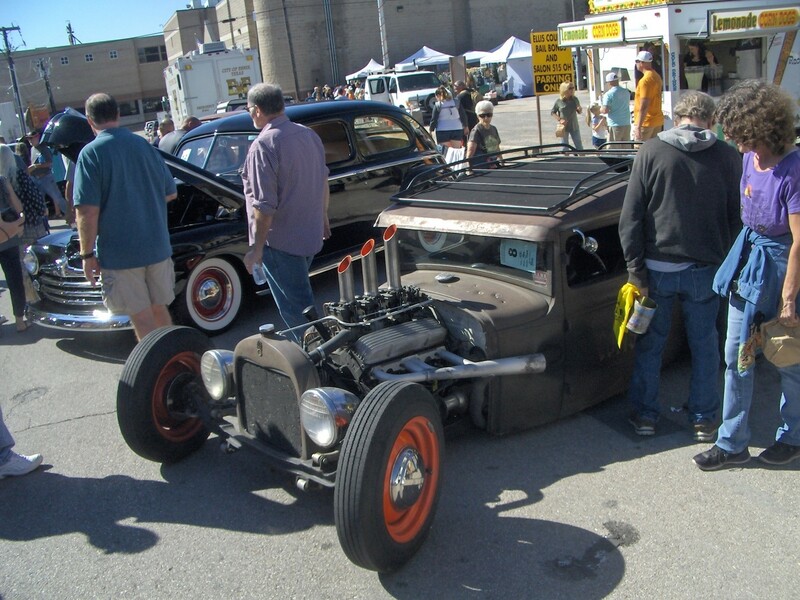 Brothers Barry and Justin held top spots in the rat rod pecking order. Their cars were the fastest and most radical…such as Barry’s ’34 Ford and ’53 Studebaker. 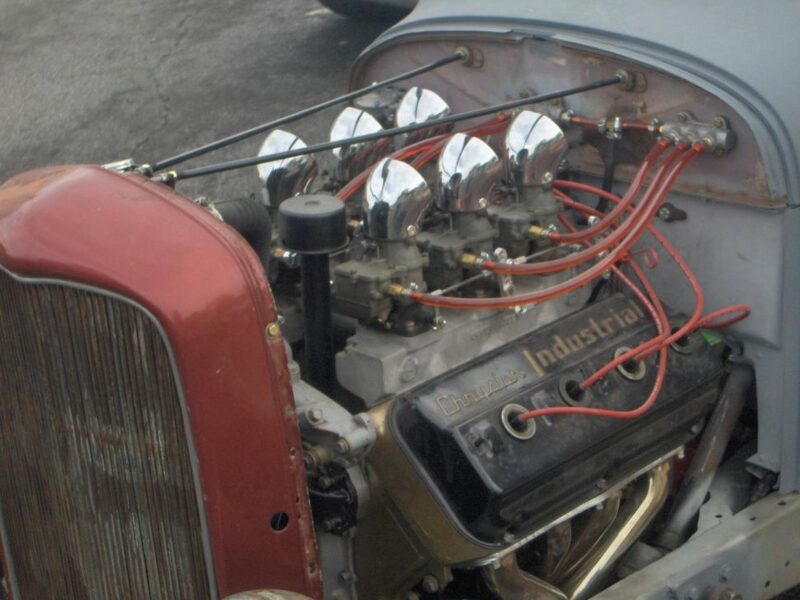 Both cars eventually shared the same Cadillac V-8 with three two-barrel carbs. Justin’s rides included a ’53 Chevy convertible with bored-out “Jimmy Six” and three two-barrels, as well as a black ’48 Chevy with 283-inch V-8. No wonder you see so many kids like my grandson Jake enjoying the rat rod aesthetic these days. They’re not all that different from the cheap and fast cars all generations seem to gravitate toward in their youth. 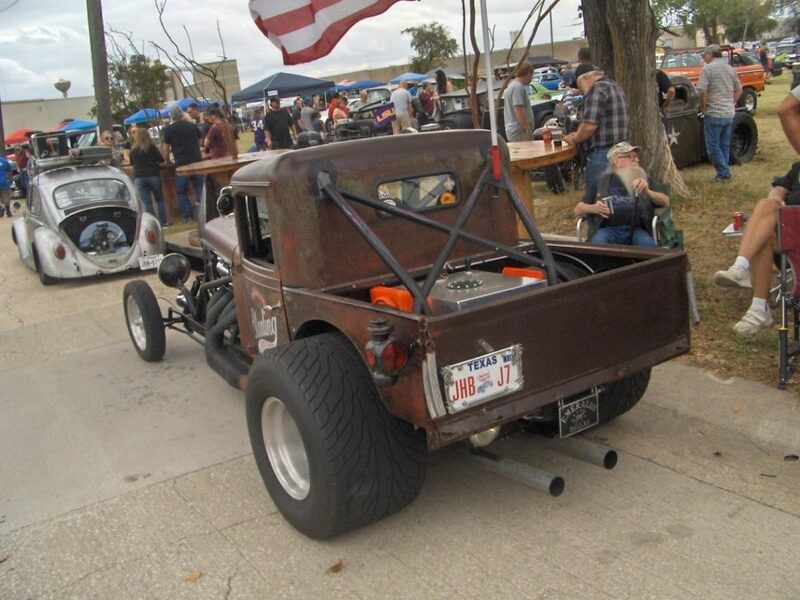 You need a sharp eye and sense of humor to enjoy rat rods. Like appreciating modern art, it’s an acquired taste. 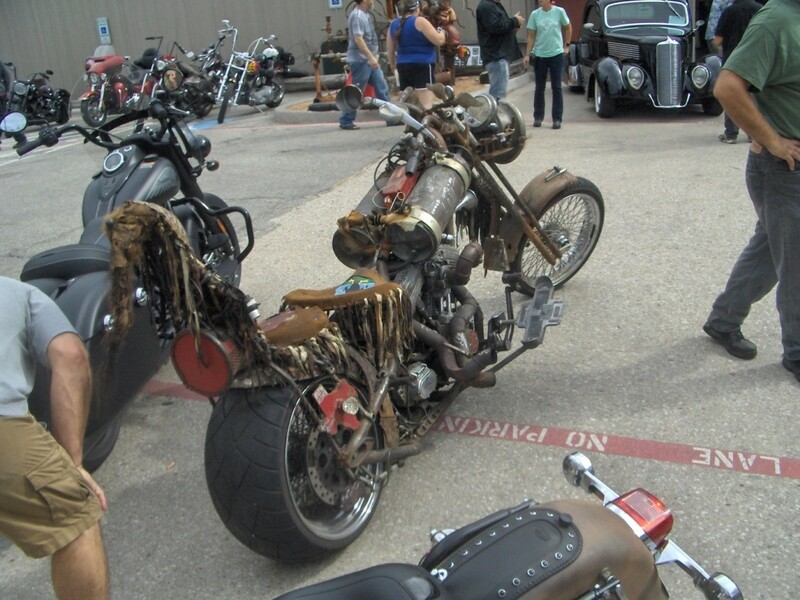 What made me laugh at the McKinney, Texas, rat rod show was the sign on a vehicle proclaiming “In rust we trust.” A common credo among rat rod disciples, there sure was a lot of rust on the 100 or so vehicles I examined that day. Some had clear-coat applications to protect rust, which came in a variety of shades and patinas. 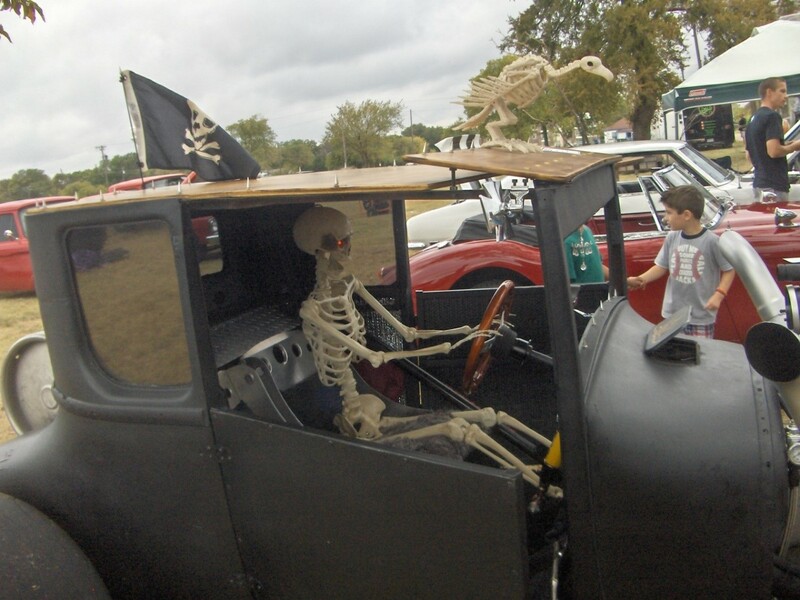 You’ve got to have a sense of humor and an eye for detail to enjoy rat rods. It looked like many rat rods started with a single part, such as a radiator cover or frame, around which everything was built. “It’s all about the hunt for parts,” a rat rod owner from my hometown explained. He was proud of the International Harvester tractor grill rigged on the front of his pickup. The roof was chopped 4 inches and a Chevy V-8 with chrome valve covers and four-barrel carb sat up front. The owner of this rat rod at a Richardson, Texas, classic car show was proud of his International Harvester tractor grill. It looked handsome…and bullet-proof. When it comes to engines, enormous V-8s — in particular, Chrysler Hemis — are preferred among rat rod owners. Mounted on sturdy frames with extra steel supports to handle their weight, the engines feature custom-made exhaust manifolds with 4-foot-long — or longer — pipes pointing to the sky. Usually muffler-less, their exhaust blats and pulses are deafening. It’s nice to see carbs in proliferation, their chromed air cleaners — sometimes six of them — reflecting sunlight like mirrors. Unusual engines are the norm. I had never seen an “Industrial” Chrysler Hemi before. Its owner told me it once powered a large boat. The valve covers alone must have been quite valuable to Hemi collectors. The owner of this rat rod told me his “Industrial” Chrysler hemi engine once powered a boat. Ever see one like this? I hadn’t…and I’ve been going to car shows for nearly 60 years. 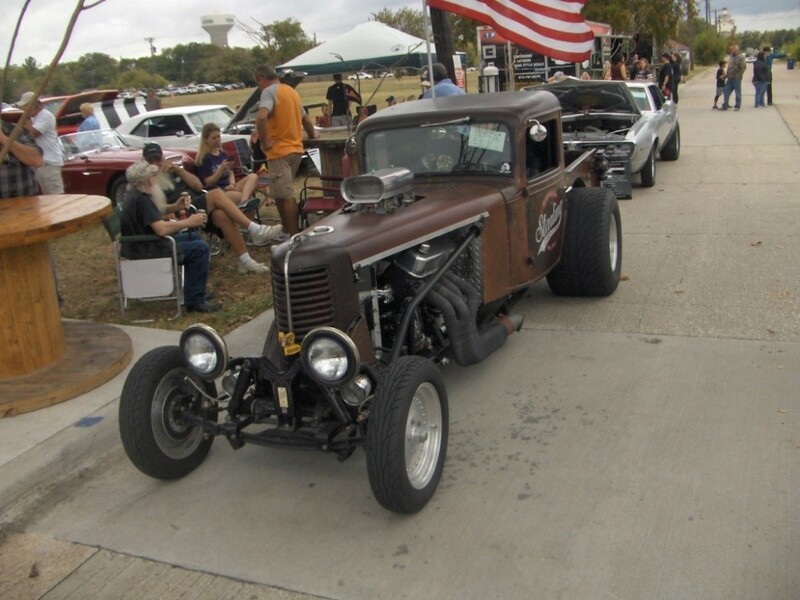 Rat rods aren’t about going fast, although most look quite capable. After all, they usually weigh less than 2,500 pounds and have 400-plus horsepower engines. It’s really about being seen. Spotting a rat rod with the largest blower I had ever seen, its compressor sticking up about four feet, I asked the owner how he could see the road, especially as the windshield was only 4 inches tall. “Easy, I look around the sides,” he said, chuckling. “Is that legal?” I asked, wondering how he got through state inspection. “They’re too busy checking everything else to worry about visibility,” he replied. I wondered about noise, too, and exhaust fumes…and hearing loss from 130-decibel pipes…and whether roll bars were needed for crashes…and how to evacuate tight interiors should doors not open in a crash…and…. Stop worrying, Jim. Remember, it’s all about having fun. You never worried about that stuff as a teen. Ear-splitting engines with tall blowers blocking the driver’s vision through 4-inch-tall windshields were commonplace. Stop worrying about safety, Jim. It’s about having fun. No matter with whom I talked, each rat rod owner told me how many hours were devoted to designing and building their custom creations. Most were fabricated in barns or backyard garages. The finished products might have passed as “barn finds.” You might say that was their goal: to produce a vehicle that looked unique and, most of all, original. Frames had to be cut and lengthened or shortened. So did doors, hoods, and windows. New steel floors were welded into place, as were custom dashboards, seat mounts, glove boxes and hangers for clutch, brake, and gas pedals. 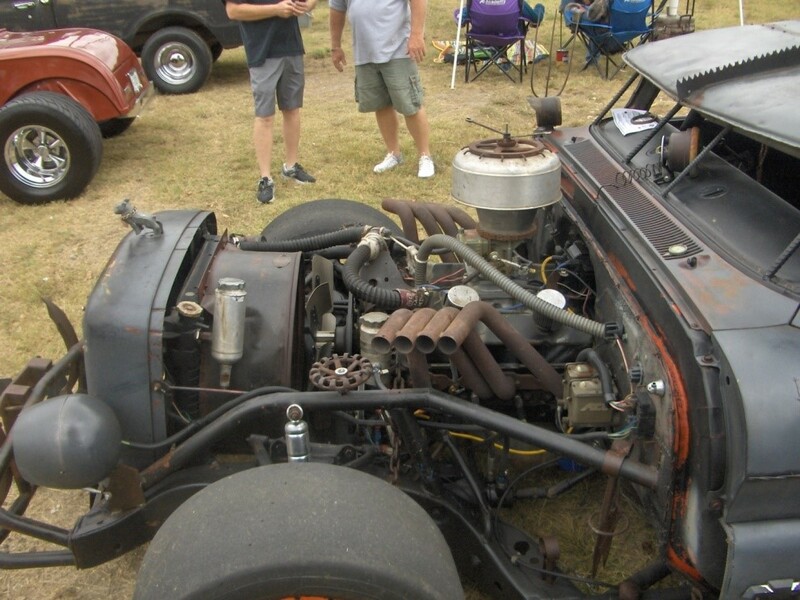 Like classic car restorations, rat rods required lots of sweat equity. 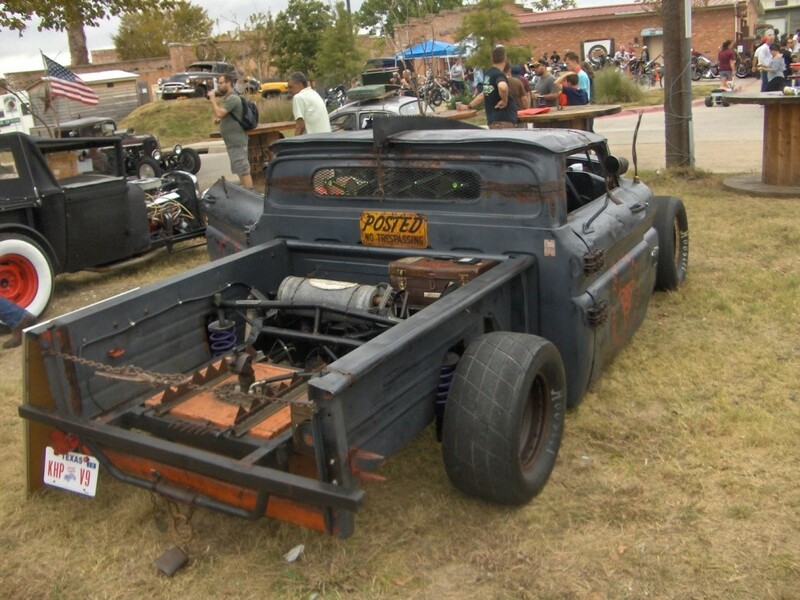 Rat rods aren’t just cars. They come in all types of vehicles from children’s bicycles and wagons to work trucks and motorcycles. 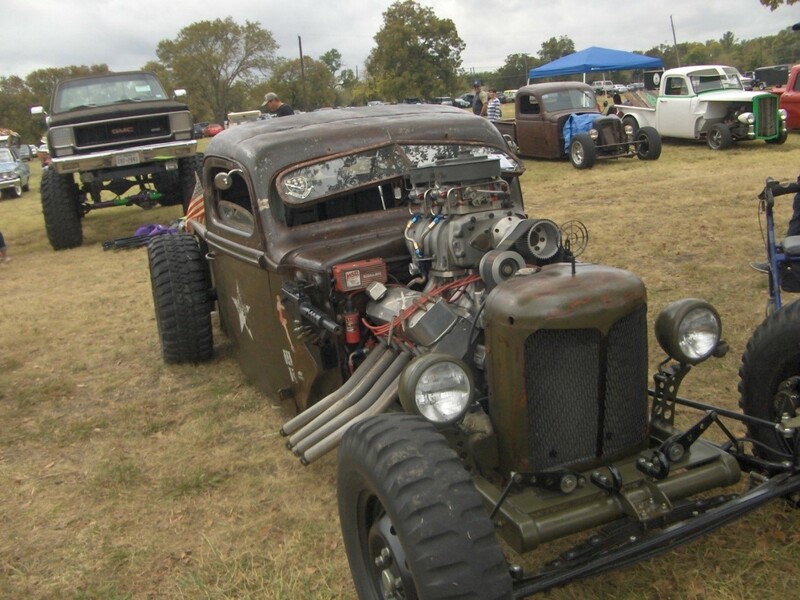 Although not always accepted at classic car and hot rod shows, rat rods have grown in popularity across the nation. They have their own shows and draw big audiences. For this reason, most car shows have special rat rod sections…and sometimes they steal the show. 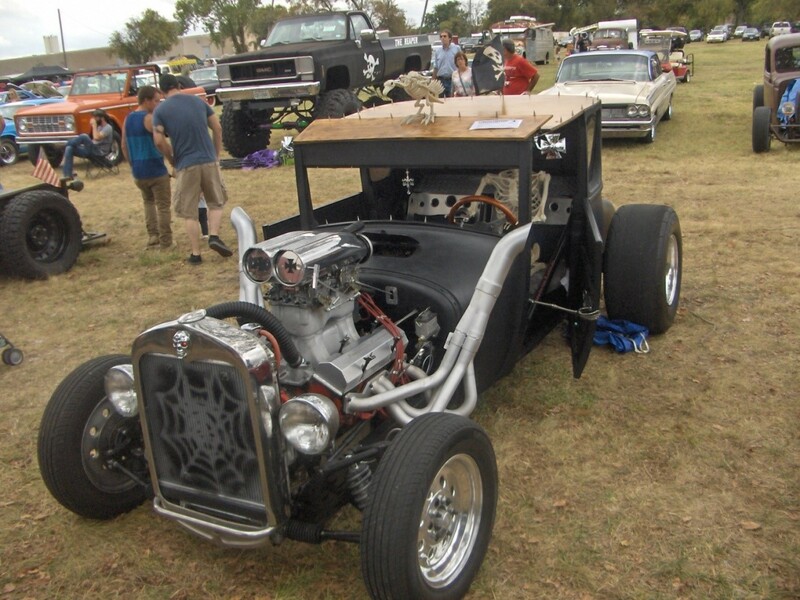 Rat rods come in many types, from pickup trucks and motorcycles to children’s bicycles and wagons. Classic car and hot rod enthusiasts may not like them, but they’re quite popular nationwide. Rat rods have grown on me over the years. I’m almost ready to take one for a spin. Stop worrying, Jim, you survived your teen driving years…as well as old cars that were no safer than rat rods.